Disclaimer: I received these Eagle Creek Pack-It Sport to review as part of being a BibRave Pro. Learn more about becoming a BibRave Pro (ambassador), and check out BibRave.com to review find and write race reviews! If you are anything like me, you guy bag is full of clothes! Some clean. Some dirty. And they all get tossed in the laundry pile after a good workout. I have known about these Eagle Creek travel pack-it bags since last year when I saw other bloggers talking about them – I just didn’t pull the trigger on getting my own. As a BibRave Pro ambassador, I was given the opportunity to try these bags for myself – and my gym bag will never be the same! I couldn’t wait to start using these Eagle Creek bags! No more random plastic gallon sized bags in my gym bag! Eagle Creek has me covered! Once I received my Eagle Creek bags, I started testing them out before I really NEEDED to use them. I pre-packed my gym bag several times and figured out how to pack them well! antimicrobial – with so much of my gear being antimicrobial, this bag set seems like it fits right in with the rest of my gear! odor control – who would want their dirty clothes stinking up their office, car, or laundry room…not me! washable – I can just toss these bags in the laundry with the clothes that I use with them! Simple! Also, the bags have hang straps which make them super easy to use in those super small gym lockers! My gym bag is stuffed most days, and keeping my Eagle Creek bags on the outside hangers keeps my locker neat and tidy! For a mid-day lunch run, my Eagle Creek pack-it bags keep my clothes fresh and ready for action…and keeps my desk area smelling nice after a run when my clothes are rank! I just pack my bags either the night before or scramle the morning of, go for a great, sweaty run, and the dirty clothes are neatly packed (or thrown together, let’s be real) in the zipper side of the clothes pouch. Pack the stink away and get on with my day! 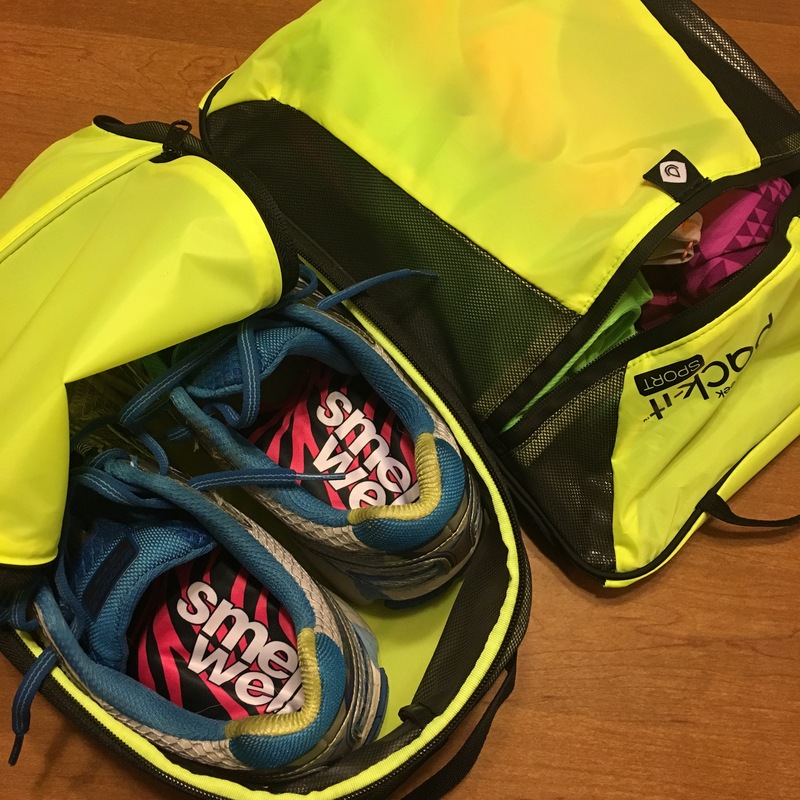 For the past several weeks, or every other weekend, I have been using a mix of my clothes bag and my shoes bag for my race day bag drop bag… There is nothing like knowing that my things are going to stay dry in the inclement weather through race day! Since they had mandatory plastic bags at the bag drop, I just needed to take all of my belongings out of the sport bag and place it in the clear plastic bag separately…whatever. My Eagle Creek sport bag also made it into some of my post race pics 🙂 Check bag photo bomb! This same weekend, I had NO TIME to mess around between finishing my half marathon on Saturday, driving home, taking a quick shower, and hitting the road to another half marathon on Sunday! I am sure glad that I pre-packed my Eagle Creek clothes bag with my Sunday necessities! It was a successful grab-and-go afternoon! Before heading back home on Sunday, I packed up my bags with my sweaty, dirty, salty, stinky gear to make the 5 hr trek home. With 6 other runners in the car, if there was residual running clothes smell, it was not from my bags! There are 13 Pack-it Sport products in this line of Eagle Creek gear and this set of Pack-It Sport bags comes in 4 vibrant colors. I choose the Tennis Ball color because I am one person that enjoys bright colors – so I picked the brightest! This set of bags are priced at $40, which which is a great price for a great organizational tool for my gym bag…and you can use code “SPORT15″ to get 15% off your Eagle Creek purchase. They have a wide selection of gear to check out! Eagle Creek will be sponsoring this Tuesday’s #BibChat at 8pm CST on Twitter. 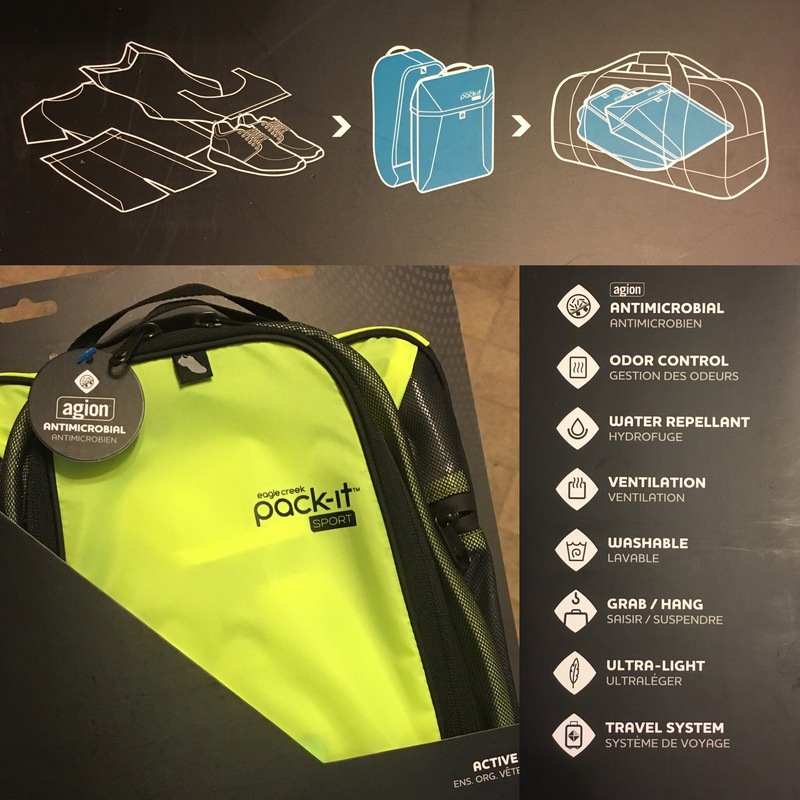 You could win a set of Eagle Creek Pack-It Sport for chatting! You can also check out Eagle Creek on Facebook and Instagram! 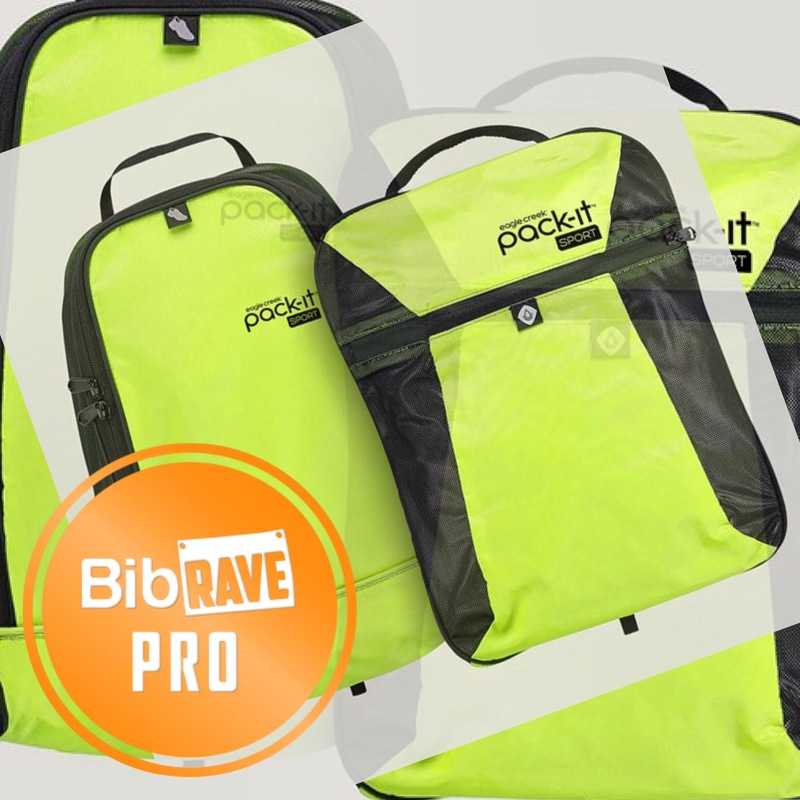 Here are some other BibRave Pro bloggers and their review of the Eagle Creek Pack It bags! Oooh, I love that bright color – it really stands out! These look great! They are perfect for my weekend running and day to day lunch runs!